After six hours of play, Yaser Al-Keliddar has taken down Event #70: $3,000 Limit Hold'em 6-Handed, here at the Rio All-Suite Hotel and Casino. The US player walked away the proud owner of his first bracelet and is $154,338 better off after beating a 221-strong field. Al-Keliddar started the day as joint chip leader with Juha Helppi and the pair had three-times more chips than their nearest rival when they sat down to play in the Amazon room earlier. It was little surprise that the eight remaining players were quickly picked off one by one throughout the day. It began with an eighth-place finish for Joao Vieira who cashed for $14,871 after getting the last of his chips in with queen high versus Mike Schneider's king high. This took the final seven to the unofficial final table and, about an hour later, Won Lee was the next to hit the rail. He got it in good on an ace-high board with ace-queen against Justin Thurlow's ace-three, which also had an open-ended straight draw. Lee didn't manage to dodge, as a three came on the river and he finished in seventh place for $14,871. With the official final table reached, the next to fall was Barry Greenstein. Greenstein had less than five big blinds when he ran pocket sixes into Al-Keliddar's pocket kings. 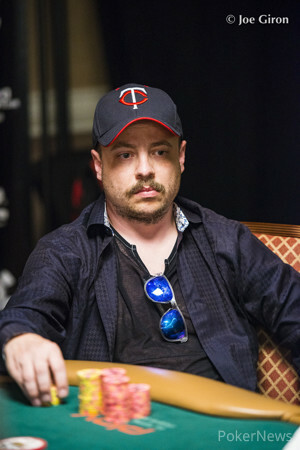 He finished in sixth place for $20,358. Mike Schneider wasn't far behind him and got the last of his chips in from the button with jack-nine against Helppi's ace-eight suited. He couldn't find any help and left in fifth place for $28,708. After making it to the top four, it took another two hours to lose another player. This time it was Andrew Yip who won $41,665 for his fourth-place finish. Just as with most of the other players before him, he was very short and got it in with king-nine against Justin Thurlow's ace-king. With no nine on the board, he made his way to the payouts desk. Justin Thurlow couldn't make it beyond third place and will take home $62,187 for his efforts. He opened the button with pocket deuces and both his opponents called. He had less than a full-size bet left and got it in ahead of Helppi's ace-eight but didn't manage to hold all the way to the river, which left Al-Keliddar and Helppi heads up. Al-Keliddar was the two-to-one favorite as the pair began their battle for the crown, and over the course of 45 minutes, his stack went up and down until the last hand, where Al-Keliddar's raise committed him to his all-in. It was ten-four against Al-Keliddar's pocket fours, and with the runout favoring the preflop favorite, the Finn narrowly missed out on the top prize, having to settle for second place and $95,380 in prize money. That left Al-Keliddar the last man standing. Speaking in an interview afterward, he explained what it meant to him to win the event. "I'm relieved because I was tied for the chip lead heading into the day, so to have blown it would have been rough. I had a lot of friends from back home who were really supportive, cheering me on, and that helped a lot. I didn't want to let anyone down. Apparently, my home casino back in the D.C. area is excited for me, which is great. First bracelet. I wasn't gonna play this thing until an hour and a half before." Born in England, Al-Keliddar moved to Washington, D.C. at two years old. He is a self-described "business guy" with "some rental properties" who plays a lot of poker, has been to law school and even had a spell as a stand-up comedian. The comedy is something that Al-Keliddar thinks adds to his game: "I like to have a lot of fun at the table and joke around, especially if my chip stack is doing well. I just like to have fun at the table I think it's important to stay loose. If you make your opponents laugh, that's good. It helps you get people to play with you over and over again." After spending six weeks in Vegas, Al-Keliddar hopes to take some time off. 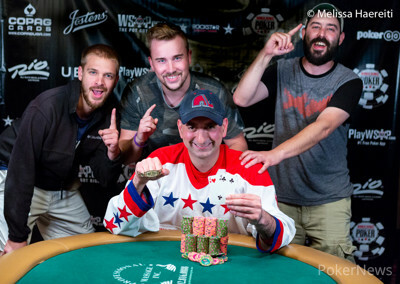 A huge congratulations go to the newest WSOP bracelet winner, here's hoping he enjoys some well-deserved time off. Pokernews will provide live coverage of every event here at the WSOP this summer. Hand #197: Yaser Al-Keliddar raised in the small blind. 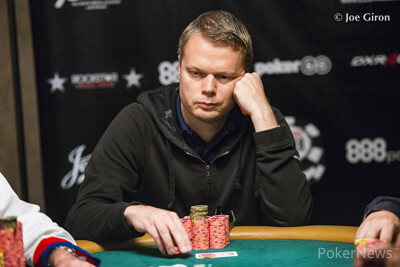 Juha Helppi called from the big blind the last of his last chips. 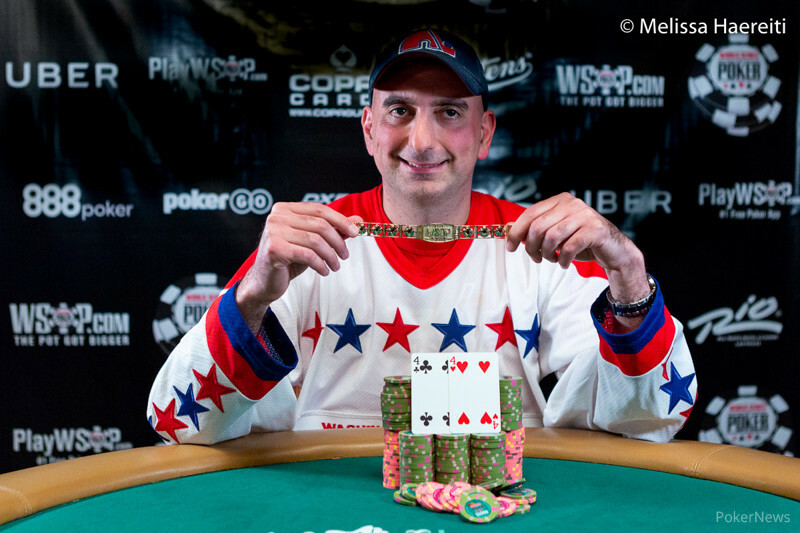 The board ran and Al-Keliddar won the tournament and the WSOP gold bracelet, eliminating Helppi in second place for $95,380. Hand #180: Juha Helppi raised in the small blind and Yaser Al-Keliddar in the big blind called. A flop reading was dealt. Al-Keliddar bet. Helppi called. The turn brought the . Al-Keliddar checked. Helppi bet. Al-Keliddar check-called. The river completed the board. Al-Keliddar checked. Helppi bet. Al-Keliddar raised and Helppi folded. Hand #181: Al-Kellidar folded his small blind. Hand #182: Helppi raised in the small blind. Al-Keliddar called. The flop came . Al-Keliddar bet and Helppi folded. Hand #183: Al-Keliddar raised in the small blind. Helppi folded. Hand #184: Helppi raised in the small blind. Al-Keliddar called. The flop was . Al-Keliddar bet and Helppi called. The turn was the and was checked around. The river completed the board. Both players checked. Al-Keliddar took down the pot with . Hand #185: Al-Keliddar raised. Helppi folded. Hand #186: Helppi raised in the small blind and Al-Keliddar called. The flop came . Al-Keliddar checked. Helppi bet. Al-Keliddar called. The turn brought the . Al-Keliddar bet. Helppi raised. Al-Keliddar three-bet. Helppi called. The river filled up the board and was checked around. Al-Keliddar showed for a flush to win the pot. Hand #187: Helppi got a walk. Hand #188: Helppi raised from the small blind. Al-Keliddar folded. Hand #189: Al-Keliddar raised from the small blind and Helppi folded. Hand #190: Al-Keliddar got a walk. Hand #192: Helppi raised from the small blind. Al-Keliddar called. The flop was . Al-Keliddar checked. Helppi bet. Al-Keliddar folded. Hand #193: Helppi got a walk. Hand #194: Helppi limped in the small blind. Al-Keliddar raised. Helppi called. A flop reading was dealt. Al-Keliddar bet. Helppi called. The turn brought the . Al-Keliddar bet again. Helppi called. The river filled up the board. Al-Keliddar checked. Helppi bt. Al-Keliddar called and showed to win the pot. Hand #195: Al-Keliddar raised in the small blind. Helppi called for his last chips. The baord ran and Helppi doubled up. Hand #196: Al-Keliddar got a walk. Hand #171: Juha Helppi got a walk. Hand #172: Helppi opened the button and Yaser Al-Keliddar defended. The flop came and Al-Keliddar check-called Helppi's bet. He check-folded the bet on the turn. Hand #173: Al Keliddar opened the button and Helppi called. There was only a continuation bet on the flop and the turn and river were checked down. Helppi took it with . Hand #174: Helppi raised the button and Al-Keliddar defended but he check-folded to a bet on the flop. Hand #175: Al Keliddar opened and Helppi three-bet in the big blind, which was called. It fell and Helppi bet the minimum, which Al-Keliddar called. The turn saw a 100,000 barrel and a call and the completed the board. Helppi barreled once more and took it down. Hand #176: Helppi raised the button and Al-Keliddar called. On the flop, it went check-call. It went check-check on the turn and Al-Keliddar led on the turn, which was enough to convince Helppi to fold. Hand #177: Al-Keliddar called the button and Helppi checked his option. The board came and there was no betting on the flop but a bet by Al-Keliddar took it on the turn. Hand #178: Helppi opened and took the pot with a bet on a flop. Hand #179: Al-Keliddar limped and Helppi checked. The flop was and Helppi lead, which Al-Keliddar called. The turn was check-called by Helppi but he check folded on the river. Hand #164: Yaser Al-Keliddar called on the button and Juha Helppi raised in the big blind. On the flop, Helppi continued and took it down. Hand #165: Helppi raised the button and Al-Keliddar called. The board was checked all the way down and the players chopped with king high. Hand #166: Al-Keliddar opened the button and Helppi called. Helppi check-folded the flop. Hand #167: Helppi got a walk. Hand #168: Al-Keliddar opened and took it down. Hand #169: Helppi raised the button and Al-Keliddar called. The flop was checked. The turn saw Al-Keliddar bet and Helppi called and it was the same action on the . Al-Keliddar showed for the ace-high flush, while Helppi mucked. Hand #170: Helppi raised the button and Al-Keliddar defended. Helppi won with a continuation bet on the flop. Hand #163: Justin Thurlow raised on the button. Yaser Al-Keliddar and Juha Helppi in the blinds called. A flop reading was dealt. Al-Keliddar checked. Helppi bet. Thurlow called with the last of his last chips. Al-Keliddar folded. The turn and river filled up the board for Helppi to win the pot, eliminating Thurlow in third place for $62,187. Hand #153: Justin Thurlow raised in the small blind. Yaser Al-Keliddar, in the big blind, called. The flop came . Thurlow bet. Al-Keliddar gave up his hand. Hand #154: Thurlow raised on the button. Juha Helppi, in the big blind, called. On a flop of , Helppi checked. Thurlow bet. Helppi check-called. The turn brought the and was checked around to the river. Helppi bet. Thurlow folded. Hand #155: Al-Keliddar raised on the button. Thurlow, in the big blind, called. A flop of was dealt. Thurlow checked. Al-Keliddar bet. Thurlow folded. Hand #156: Al-Keliddar got a walk. Hand #157: Al-Keliddar raised in the small blind. 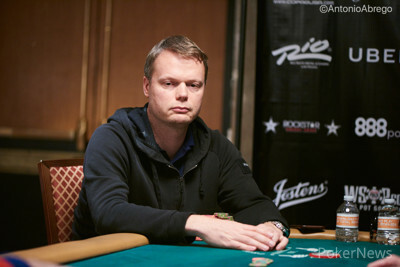 Juha Helppi, in the big blind, three-bet. Al-Keliddar called. On a flop of , Al-Keliddar checked. Helppi bet. Al-Keliddar check-called. The turn brought the . Al-Keliddar checked. Helppi bet. Al-Keliddar folded. Hand #158: Thurlow got a walk. Hand #159: Thurlow raised in the small blind. Al-Keliddar, in the big blind, called. On a flop of , Thurlow bet and Al-Keliddar called. The turn brought the . Thurlow bet. Al-Keliddar tank-called. The river filled up the board. Thurlow bet. Al-Keliddar raised. Thurlow gave up his hand. Hand #160: Thurlow raised all in on the button. Al-Kellidar, in the small blind and Helppi, in the big blind, called. The flop came . Al-Keliddar bet. Helppi called. The turn was the . Al-Keliddar bet again. Helppi called. The river filled up the board and was checked around. Helppi showed , Al-Keliddar revealed and Thurlow tabled to survive. Hand #162: Thurlow raised in the small blind. Al-Keliddar, in the big blind, three-bet. Thurlow called. The dealer spread a flop of . Thurlow checked. Al-Keliddar bet. Thurlow gave up his hand. Hand #142: Juha Helppi got a walk. Hand #143: Justin Thurlow got a walk. Hand #144: Yaser Al-Keliddar got a walk. Hand #145: Thurlow opened button and Al-Keliddar called in the small blind. On the flop, Al-Keliddar led and Thurlow called. The turn and river were both checked and each player turned over ace-six for a chop. Hand #146: Al-Keliddar opened the button and Thurlow called in the big blind. Thurlow then check-folded the flop. Hand #147: Thurlow made up the small blind and Al-Keliddar checked his option. It was an flop and both players checked. The turn saw Thurlow bet 80,000 and Al-Keliddar came along. The river went check-bet-fold and Al-Keliddar took it down. Hand #148: Thurlow opened button and took it down. Hand #149: Helppi raised in the small blind and Thurlow three-bet. The flop came and the players ended up four-betting to the tune of Helppi's all-in. Helppi had versus Thurlow's pocket with one card to come. It was a on the river and Helppi got a double. Hand #150: Helppi opened the button and everyone folded. Hand #151: Al-Keliddar called in the small blind and Helppi checked. It fell on the flop and Al-Keliddar check-folded. Hand #152: Thurlow got a walk.